Meet Roselyn. She's six months and two days older than my Cate. 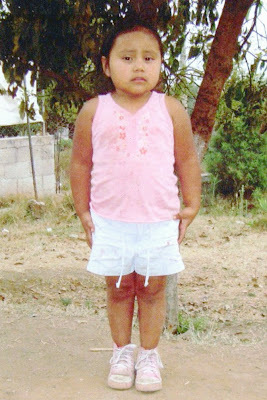 Roselyn lives in Villa Nueva, Guatemala. Her town depends on a couple dozen local factories. This not-yet-4-year-old girl, who lives with her working mother, is responsible for cleaning and running errands. We decided recently to sponsor Roselyn through Compassion International. For just $38 each month, we're hoping to impact her life. To bless her. So she can be a blessing to her family and her community. This week I received our sponsorship information in the mail. I've also been reading this week first-person accounts from bloggers in Guatemala spreading the love of Jesus there and the ministry of Compassion International here Coincidence? I doubt it. Really, I serve a God who is into the details of our lives. I have no doubt God wanted me to learn more about Roselyn's country. And God wanted to remind me about what he's called me to do. I want to teach my daughter that there are people all over this world who need Jesus. They live in other places, worlds apart, but there are little girls who like to sing and draw, just like my Cate does. I want my daughter to be able to learn the power of praying for a situation that is completely out of our control. And I trust that one day she'll see how our minimal financial sacrifice and our prayers and our letters sent to a land we have only read about have blessed one girl. And that one girl blessed her family and her community. Last night I read "A Short Guide to a Happy Life" by Anna Quindlan. Her words stayed with me as I thought about Roselyn, a girl I've never actually met. Life is made of moments, small pieces of glittering mica in a long stretch of gray cement. It would be wonderful if they came to us unsummoned, but particularly in lives as busy as the ones most of us lead now, that won't happen. We have to teach ourselves how to make room for them, to live them, and to live, really live. And I believe sponsoring Roselyn will help my family really live. And surely it will help her and her family really live. May we all find beautiful, shimmering rocks in the plain cement. Sure, it's just one girl. But I want to share what we know of God's faithful promises with her. Because every girl [and boy] deserves a chance to know that. Makes $38 a month seems less like two lunches out after church or 1 1/2 cans of Enfamil formula for my 9-month-old son and more like a minimal price to share some of the good we know. And then I can say, like Quindlen: I learned to look at all the good in the world and to try to give some of it back, because I believed in it completely and utterly.